Nov 29 2016 by Chris Sigman. Sometimes, it can be hard to think of the right gift for people. Even if you can think of a good one, sometimes you still want some more ideas. And sometimes, you’re shopping for yourself. Whatever your reason, we’ve got some holiday gift ideas for you! Earlier this year, NASA JPL released a series of travel posters for the planets of the solar system, and beyond. These are great gift ideas for the space lover in your life, and there’s plenty of shops on Etsy that carry the posters and derived merchandise. We liked these so much, we did a poster giveaway contest for them! 3D printed things are really cool, if for no other reason than we encounter so few things that are. For some extra special rocketry related gift ideas, check out Shapeways. They’ve got everything from model rockets to miniatures, keychains to necklaces. There’s even a scale model of the solar system! Clothing gifts can be some of the lamest gift ideas. Who likes getting underwear for Christmas? But there’s plenty of good gift ideas to be had in the space themed clothing department. Star Wars inspired t-shirts are a fan favorite, such as those found on We Love Fine. For the colder weather of winter, or a capsule landing in the frozen tundra of Siberia, there’s jackets like the Space Jacket from Betabrand. And for one last suggestion, you could go retro with Space Invader themed socks and other clothing. Those are some of our favorite gift ideas, and we hope they help you out! Regardless of whether you’re shopping for your friends and family or for yourself.  Got any ideas of your own? Feel free to let us know! NOTE: These ideas are solely based on the opinions of its author. Neither its author nor Mach 30 make any gain from the sale of these products. Mach 30 makes no guarantees on these gifts. Feb 22 2016 by Chris Sigman. 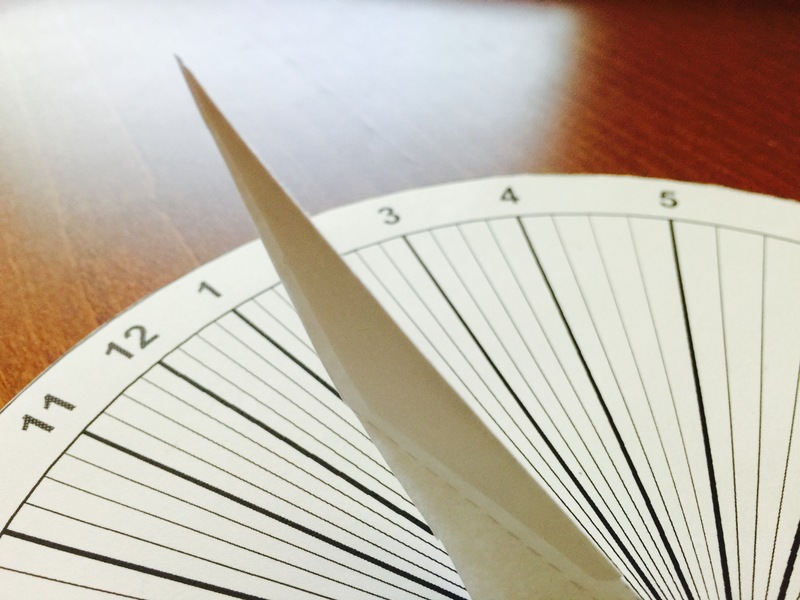 A few months ago, I came across an Instructables project for a paper sundial. Papercraft projects are some of my favorites, because all I usually need is basic elementary school supplies that are lying around the house. Some of them are probably even from when I was in elementary school! Even better: because we’re working with paper, it doesn’t hurt much when you mess something up. With how easy this is, it’s a great project for all ages, especially for kids or your inner Maker! You can find all the instructions and resources you need for this 15-minute project at Instructables. As a brief overview though, the writer created an online tool you can use to generate a PDF that customizes the sundial for your location, and whether you want it set up for summer or winter. 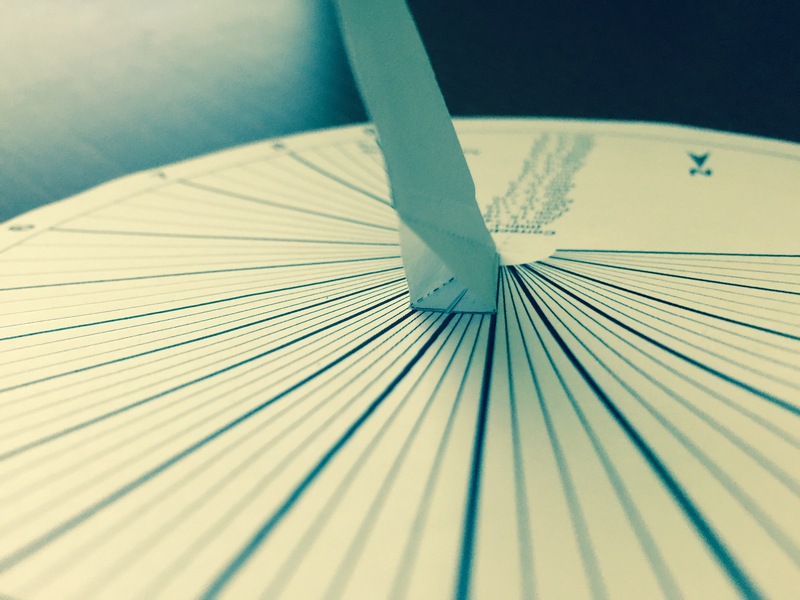 From there, you print, cut, glue a little, and you’ve got your very own paper sundial. There’s one thing that I found a little tricky though, that I thought I’d share so you can benefit from my experience. In step 4 where the paper sundial instructions talk about how to fold the gnomon (the piece that casts a shadow to show you what time it is), I found it a little unclear how the folds should look, and even glued the wrong things together. No worries though, because like I said before: it’s paper, and you can just print out a second gnomon! Below is a picture of the northern-facing side of it, to give some extra perspective. Hopefully that makes things clearer for you if you ran into the same problem I did. Once I was all done, I noticed that my gnomon of my paper sundial wasn’t quite straight. The instructions point out some ways to avoid or fix this, but I went with a different route. When I cut out the dial, I glued it on some card stock (aka thick paper if you’re not familiar with it). So, to straighten out the gnomon, I just cut some of the excess from what I used for the dial, folded it in half, and glued it on. Perfectly straight now! In the picture below, the darker area of the gnomon you see is where I glued on the cardstock. With daylight savings time mixed with winter weather consisting of a lot of clouds and snow, I haven’t been able to take it for a test drive. It’s a bit hard to catch days that are sunny and will therefore let the sundial cast more of a shadow, but I’m confident from some of my pictures that it’ll work perfectly. Finally, for some extra education: why are the hours in the dial not evenly spaced? 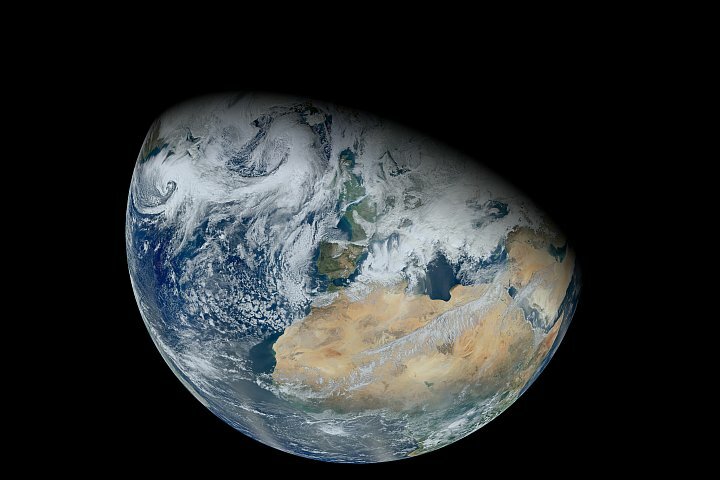 After all, the Earth doesn’t rotate at different speeds throughout the day (although when you’re at work or in school, it can feel like it’s slowing down). The reason why is because this is a horizontal sundial, one that sits flat on the ground. Equatorial sundials, like picture below of a sundial in Beijing, have their dial aligned with the angle of the sun on the sprint and fall equinoxes. This makes it so that the shadow cast by the gnomon directly follows the motion of the sun, and thus the motion is constant. One more thing to know: on days residing on the winter side of the equinoxes, the top side of the dial is used to show the time, and the rest on the bottom side. Equatorial sundial in the Forbidden City, Beijing. Picture from Wikipedia. I hope you enjoyed making a paper sundial, and maybe even learned some things. 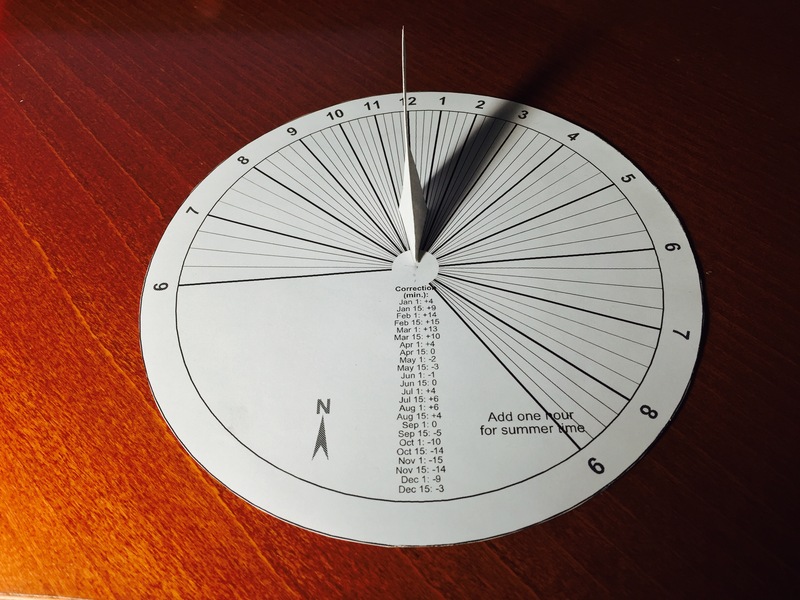 If you’ve gone the extra mile and customized your sundial, we’d love to hear about it (or even see it!). Post a comment here, or even better, show us on Facebook, Twitter, Google+, or another social media site of your choice. Oct 16 2015 by Greg Moran. Did you know that the International Space Station (aka the ISS) typically flies over your head about a half dozen times every day? More importantly, did you know that you can actually see it happen with your naked eye? Admittedly, you can’t always just look up and see it whizzing by. There are two reasons for this. The first is because the sky is too bright during the day. Second, during the night, all the Earth’s satellites are in its shadow. There are, however, two small windows each day in which it is possible to see the orbiting satellites flying overhead. These windows occur during the “terminator conditions”. Sadly, they have nothing to do with Arnold Schwarzenegger. They do, however, have everything to do with the transition from day to night. The “terminator line” is the region on Earth between daylight and night time. PHOTO CREDIT: Image by Norman Kuring, NASA GSFC, using data from the VIIRS instrument aboard Suomi NPP. A terminator, also called “twilight zone” or “gray line,” is a line that separates the day and night sides of a planet. In other words, “terminator conditions” simply mean sunrise and sunset. During these periods, the Earth’s satellites come out of the shadow and are able to reflect the sun’s light. Besides that, the sky is lit up just enough to make bright objects visible, but not so much that they’re drowned out. 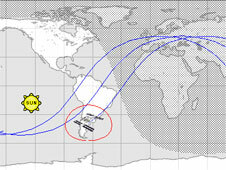 The weather and sky conditions also play an important role in how well you are able to see the ISS as it flies over. Obviously, you won’t see anything if it’s cloudy, and you won’t want to go outside if it’s too cold. Therefore, you want to be smart and plan ahead. You can get a weather forecast anywhere, but “sky conditions” are a little harder to find. Sky conditions determine two things: cloud cover and the probability of rain. You also want to know the moon’s current phase because that affects how well you can see at night. You can check out the Sky Charts from Clear Dark Sky to make sure. Let’s dig a little deeper into the details, shall we? Heavens-Above. This site is the most technically accurate and computationally full featured. This is best if you are comfortable with tech and have a basic understanding of astronomy. Besides the ISS, it has a ton of other satellites that you can track. NASA’s Spot the Station. Probably the most user-friendly option — it is NASA’s ISS after all, which means they have the best resources. Satellite Flybys. Just enter your zip code and voila! It’s not the most accurate, but more than good enough to get you looking in the right direction. ISS AstroViewer. Of all the sites on my list, this has the least features. It’s not very complicated, but it still tells you when and where to look. All you need is to input your city name. 2.) Use a recording device. 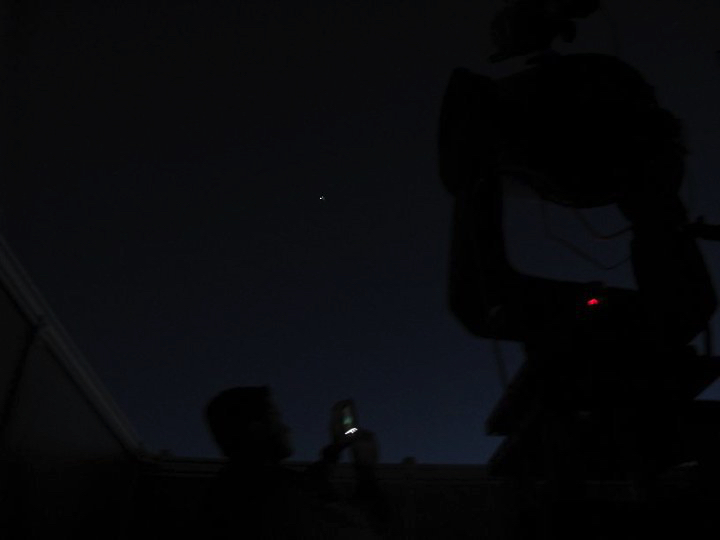 Like we said, the ISS is usually bright enough to be seen with the naked eye, and therefore a decent quality camera or even some camera phones will be able to see it. Of course, the better the camera, the better the quality of pictures and video that you can get. If you can get your hands on an SLR camera and some good telephoto lens, even better. If your device allows it, use “low-light” or “nighttime” mode. If you’re using a DSLR or manual lenses, adjust your apertures, ISO settings, and exposures accordingly. 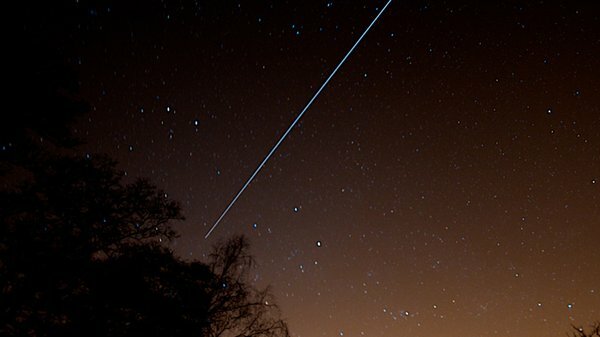 Long exposure photographs will produce a “streak” as the ISS flies through the frame. You’ll also want to use some kind of stationary object to steady your camera, like a tripod or luggage rack of a parked car. This is especially important when you’re using telephoto lens or low light settings, because your device will be much more sensitive to movement, and therefore more likely to blur. The more versatile the mount, the better. The ISS doesn’t hang around in any area for vary long, so get ready to readjust the field of view as the station moves across the sky. Trust me, you’re going to get excited and want to gasp, and point, and do a little dance when you spot the iSS (or is that just me? No, it can’t be). So again, plan ahead and set the camera up early, leaving you to enjoy the event without worrying about messing up the shot. 3.) Post online. All that hard work and success deserves a little recognition, and we at Mach 30 would definitely love to see what you get. Just post it on your favorite social media site (or all of them, because why not), and tag us. Use @Mach_30 on Twitter, @Mach30 on Facebook, +Mach30 on Google+, Mach30-blog on Tumblr, and Mach 30 on YouTube. Then you can brag about your ISS tracking skills! PHOTO CREDIT: Greg Moran, cerca 2010 in Dayton, OH via Creative Commons.